President Donald Trump has been taking his talking points and political cues from Fox News shows and personalities. The president's been known to tweet out quotes from Fox's broadcasts, mention Fox News in social media posts, and repeat arguments he's heard on the channel within minutes of them airing. His administration has ushered former Fox News personalities like John Bolton and Heather Nauert into the White House, and "Fox & Friends" weekend host Pete Hegseth was previously under consideration for Veteran Affairs Secretary. "I think that folks in our line of work have had to rethink the way we view Fox News programming in some ways," said Callum Borchers, who covers media and politics for the Washington Post. "It is not purely a news program. In some ways, you know, it really is a briefing for the president." 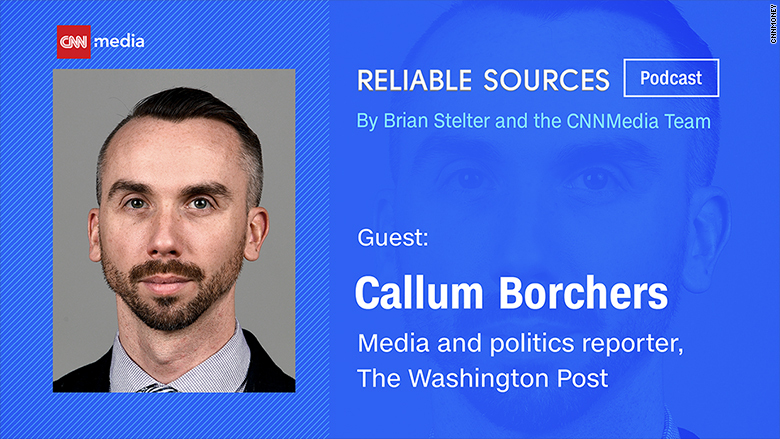 Borchers sat down with CNN's Brian Stelter to discuss the trickle-down effect Trump's TV viewing has on U.S. politics on this week's "Reliable Sources" podcast. The Fox-Trump feedback loop was on display earlier this week after a "Fox & Friends" segment last Sunday highlighted a caravan of largely Central-American migrants moving up through Mexico to the U.S. border. The president soon fired off numerous tweets about the need for a wall on the Mexican border. He continued tweeting into Monday, saying that "DACA is dead" and calling for congressional border legislation. By Tuesday, Borchers said, "he wasn't really willing to wait for the wall or the border legislation to kick in." Trump signed a memorandum on Wednesday to deploy the National Guard to the southwest border. BuzzFeed initially reported on the caravan on March 30. "While it's true, as Sarah Sanders said in the briefing, that the president has been talking about border security since he launched his campaign, yes, obviously that's the case, but this particular episode, this sudden urgency to deploy the National Guard, appears quite clearly to be triggered by Fox News," Borchers said. Fox News hosts and personalities don't just talk about issues that Trump picks up on, though -- they also speak to him through the TV. In January, Fox News legal analyst Andrew Napolitano looked straight into the camera to address President Trump directly about his administration's call to reauthorize part of the Federal Intelligence Surveillance Act. "Mr. President, this is not the way to go," Napolitano said at the time. On Thursday, Napolitano advised Trump not to sit down with special counsel Robert Mueller. Sometimes, though, the advice Fox hosts offer Trump contradicts the president's earlier statements. Trump recently spoke out about wanting to withdraw troops from Syria, but the hosts of "Fox & Friends" discouraged such a decision on Wednesday's show. "I think the president is too smart," "Fox & Friends" host Brian Kilmeade said. "He knows what happened when President Obama took his troops out of Iraq... Man, it was a dumb move for him to do that. Look, it created ISIS." The show's choice to go against Trump's views made for a "striking moment," Borchers told Stelter. "As viewers who watch the show regularly know, the program is mostly positive reinforcement for the president, but not exclusively so," he said. "There are times when they seem to use their platform that they are aware of to challenge his thinking and perhaps get him to change his mind." Fox is "pretty well aware of their influence" in this administration, Borchers said. "I think that when we look at the content on that channel, you know, it's not just entertainment or it's not just information," he said. "It is something that the president really takes to heart sometimes, and I think we need to be mindful of that."